Looking for some unique holiday gifts? The Christkindlemarket is definitely the place to visit! 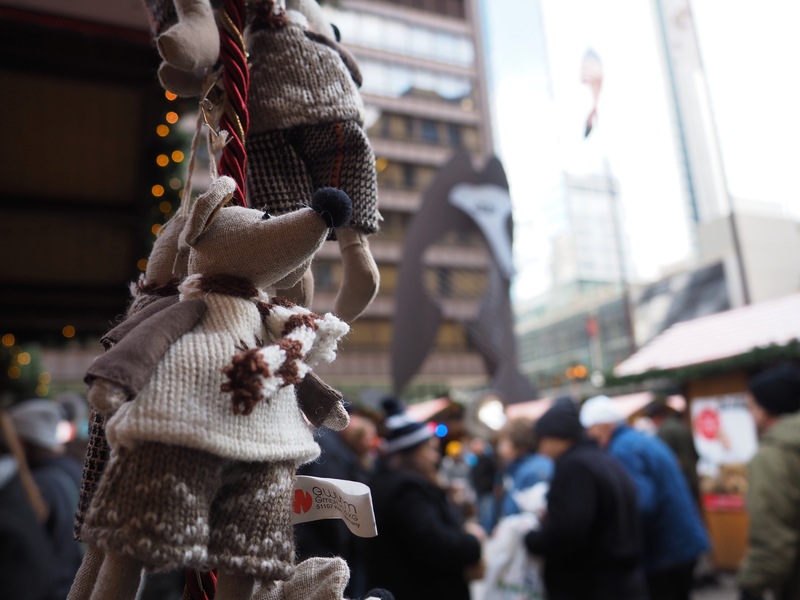 Each of the little shops offers something different, from hand-painted ornaments and nutcrackers, to candied nuts and knit scarves. I recently posted about our outing on the blog, so for more info and lots of pretty photos, click here. You know that big, beautiful zoo in the middle of Lincoln Park with all the awesome animals and a gorgeous backdrop of the Chicago skyline? Yea. That’s the one. Now imagine walking through it at night, sipping some yummy hot cocoa and taking in tens of thousands of tiny, twinkling holiday lights. It’s a pretty stellar sight and, best of all, it’s FREE! 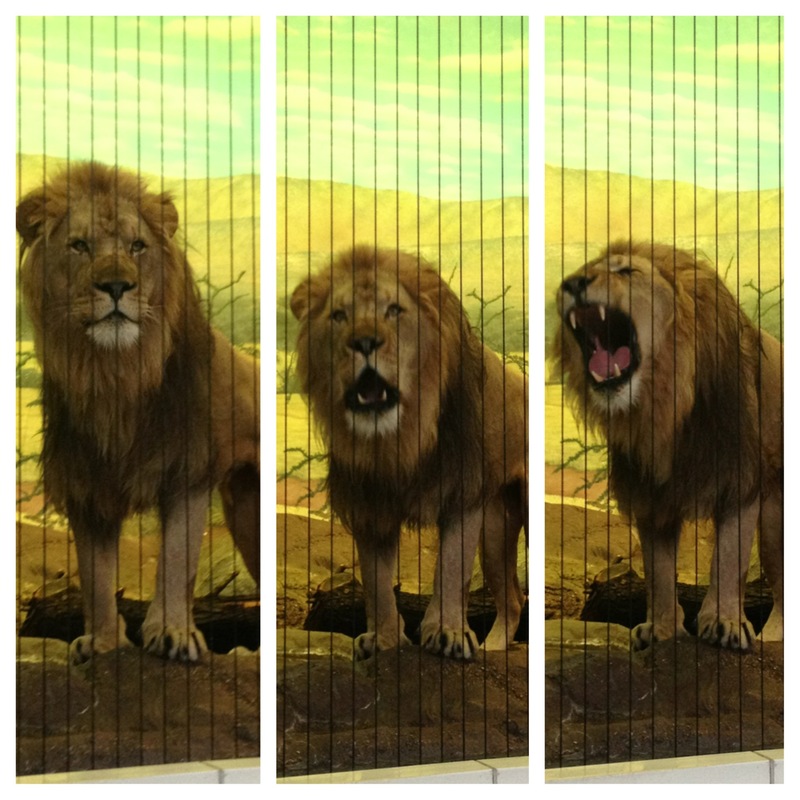 In addition to the usual, awesome exhibits, there are ice sculptures, games and this year the zoo has even added a few adults only nights for those of you who are kids at heart but might not want to be around actual, you know, kids. I have to give credit where it’s due – it was actually my husband who introduced me to this awesome, if somewhat hidden, holiday tradition. The swanky suburban neighborhood of Lincolnwood Towers has gained quite the reputation for its ostentatious displays of holiday cheer. Pack some mugs of hot chocolate, hop in the car and blast Elvis’ Christmas Album on the stereo (this last part is mandatory to get the most out of the experience). The trick to enjoying the Towers is to go early enough in the season that you don’t get stuck in a line of traffic, but not so early that people haven’t strung up the lights yet. I still remember the protesters outside 111 N. State Street on the day that Macy’s officially flew it’s banner on what, for many Chicagoans, will always be Marshall Field’s department store. Myself not a native of the Windy City, I wasn’t quite as moved by the significance of the change, but I was relieved to see Macy’s hold onto some of the city’s most beloved holiday traditions. The exterior of the massive building (which takes up an entire city block) is still decked out in it’s trumpets and holiday banners. 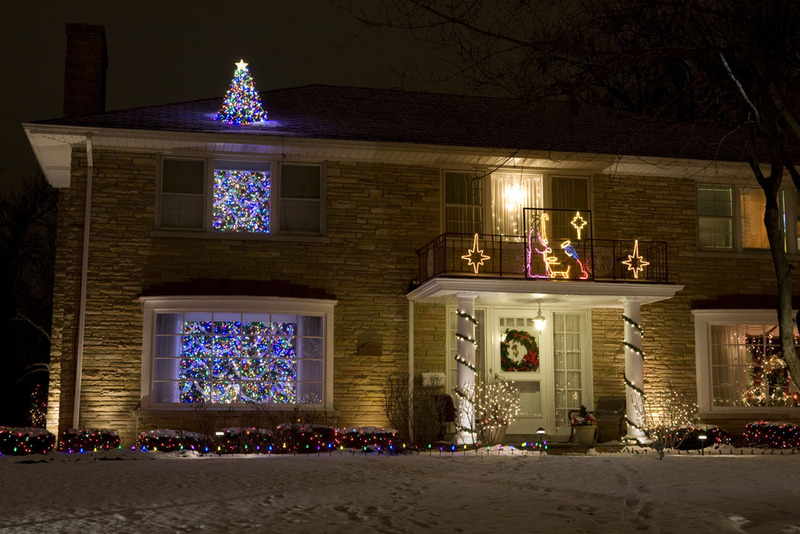 The windows are dressed with Christmas scenes, each year depicting a different theme. 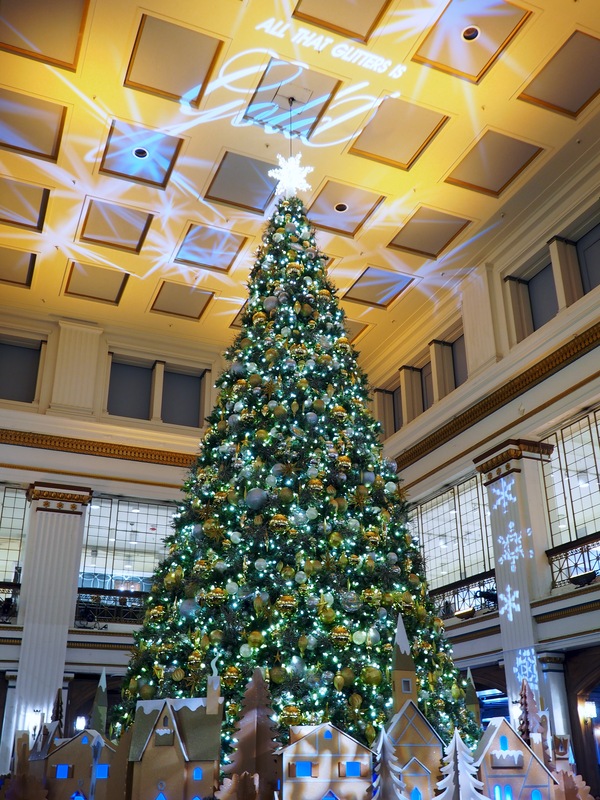 And, most importantly, a big, beautiful Christmas tree stands at the center of the Walnut Room. Loving the blue and gold theme for this years tree! Walking into this historic restaurant, one can certainly feel the history in the rich, walnut paneled walls and the picturesque floor to ceiling windows that look out on the heart of downtown Chicago. Lines for a table can be long, and I can’t promise that the food alone is worth the wait, but I love to go just to sit under the lights of the beautiful tree, sip some hot chocolate, and take in the crowd around me. Tip: If you want to avoid the crowds (understandably), head straight to the 8th floor for a great photo op, where you can take in the entire room and stand eye level with the star on the top of the tree. 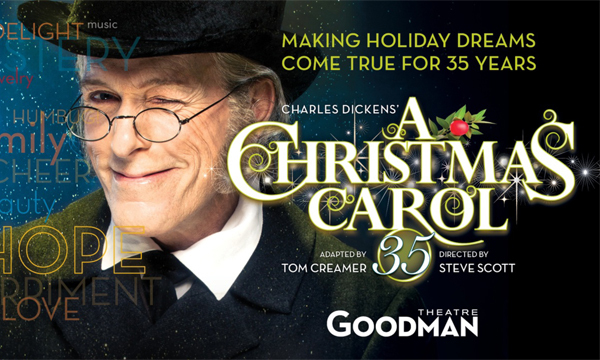 To be fair, I’m a huge fan of Charles Dickens to begin with, so I pretty much eat up any version of this sappy holiday favorite with a spoon (A Muppet Christmas Carol FTW!). That said, the Goodman puts on an amazing production in it’s own right. I’ve seen it three times, including an especially poignant viewing with the guests of the homeless shelter where I was working at the time, and each show has been better than the last! For a lesser known, but hilarious, holiday theater experience, head to the Theater Wit in Lakeview for a re-enactment of David Sedaris’ Santaland Diaries. When Eric and I were first dating, I force-fed him a steady dose of Sedaris’ short stories, and this was by far one of our favorites. So for Christmas that year I took him to see this one-man show and, if possible, it turned an already side-splitting tale about Crumpet the Elf into something even more hilarious. Definitely don’t miss it! 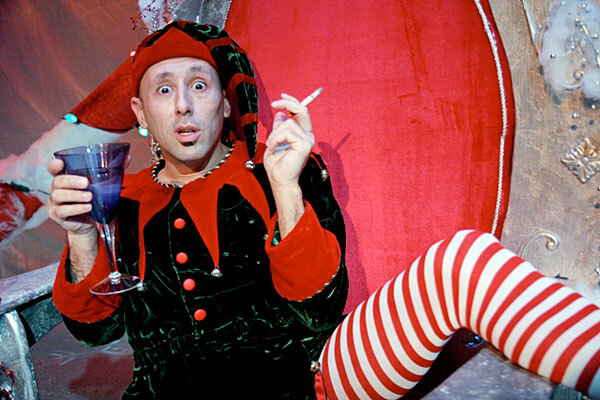 Mitchell Fain is hilarious as Crumpet the Elf. Photo courtesy of Chicago Magazine/ Johnny Knight. 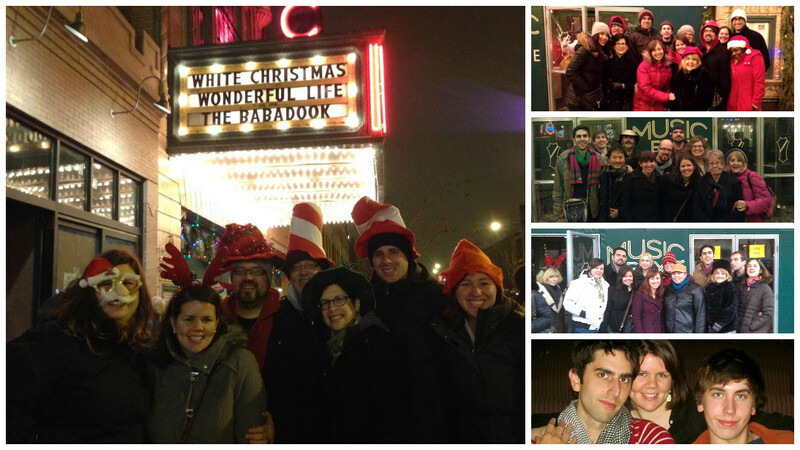 Late Night Andersonville, an annual neighborhood event where shops, cafes and bakeries stay open an additional four hours for holiday festivities. Some stores have little treats laid out, or hot chocolate, while others have live music and Christmas carols. I won’t go into too many details, as I recently attended this year’s event and wrote a very detailed post about it. If you’re interested, check it out here. 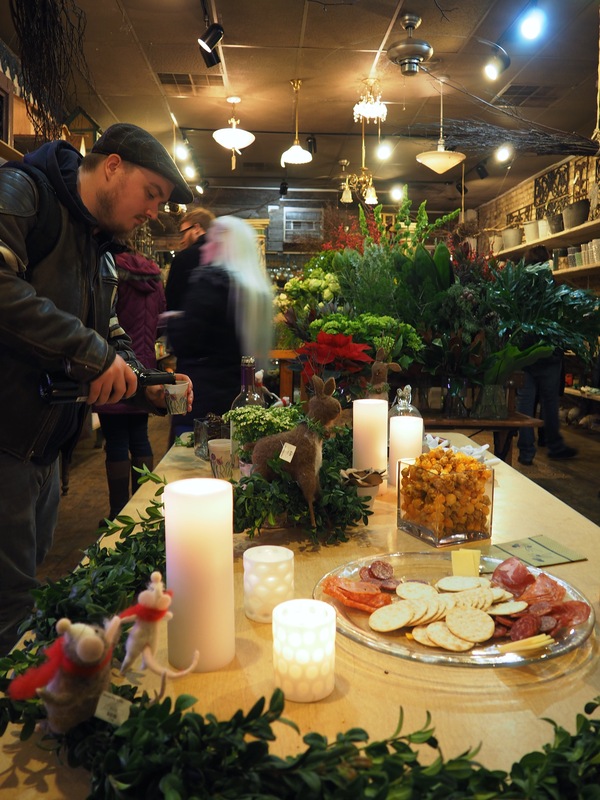 Treats and live music at Marguerite Gardens Florist in Andersonville. 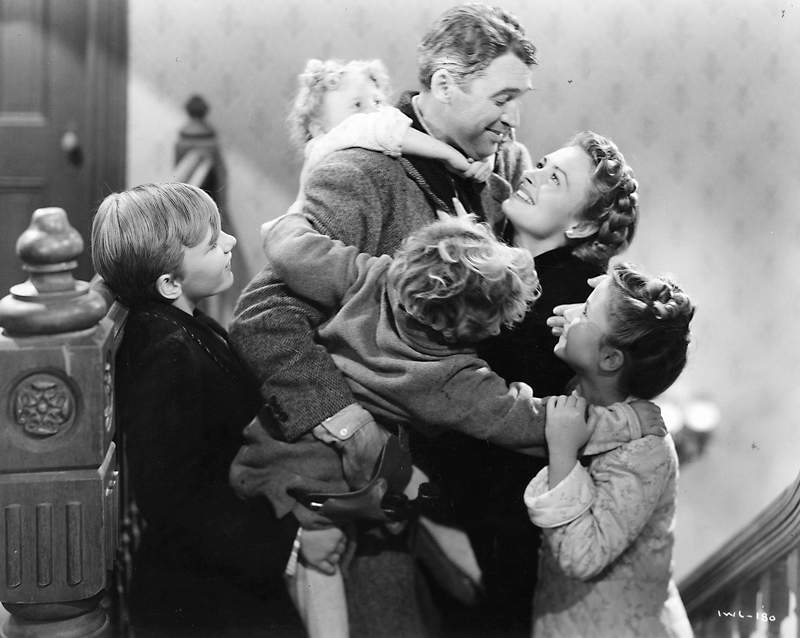 Every December, this historic Lakeview theater on Southport holds it’s annual Christmas show, featuring a festive sing-a-long with Santa and a double feature of two holiday classics: It’s A Wonderful Life with Jimmy Stewart and Bing Crosby’s White Christmas. If you’re like me, you’ve seen both these movies enough times that you might question if it’s worth paying the ticket price for yet another viewing. Trust me – it is! The audience hissing at grumpy old Mr. Potter or singing along with Bing as he croons in that familiar baritone brings the nostalgia of these holiday classics to a whole other level. The Music Box Christmas Show is now in its 32nd year, though the first time I attended was eight years ago with my best friend, Sawyer. It became a regular holiday fixture in our friendship and over the years our group grew to include families, partners and new friends. We’d make a night of it, taking in the movie and then finding a nearby bar or restaurant to continue the fun. Two years ago, Sawyer moved around the world to Thailand, and though we are still in touch, and I still get a group together every year for this Music Box tradition, not having him sitting next to me bellowing out each corny tune leaves a big hole in the day I’m sure to never fill until he comes to his senses and returns. Until then, I’ll just have to keep singing loud enough for the both of us. 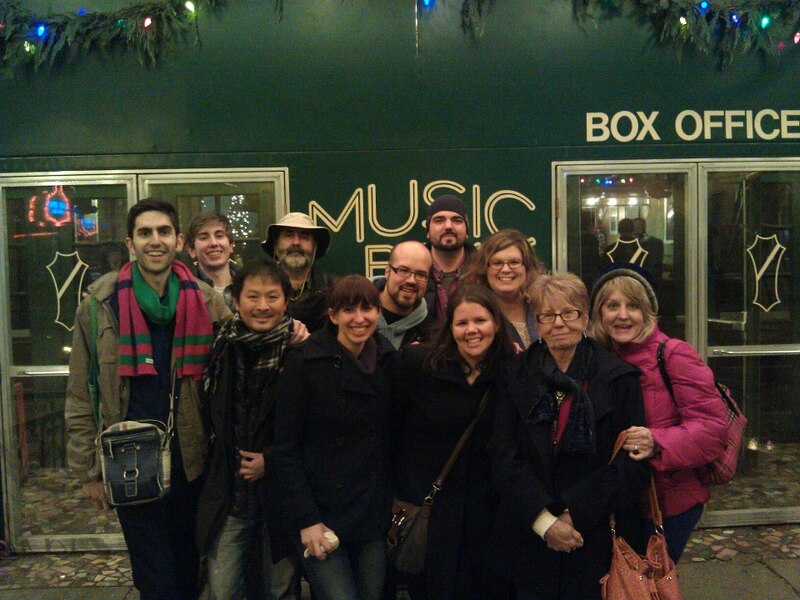 A few memories of our yearly Music Box tradition. 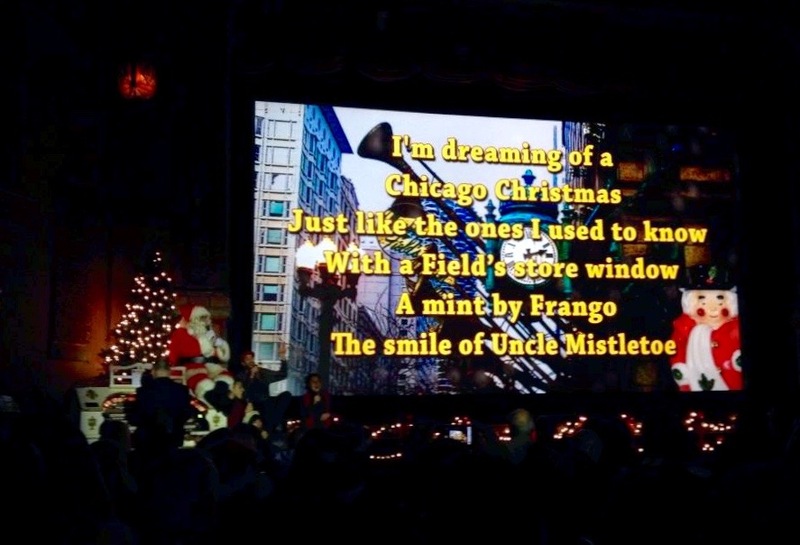 What Chicago Christmas traditions am I missing out on? Let me know in the comments!